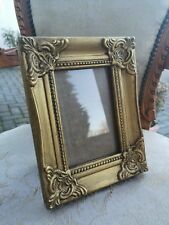 Gold Gilt Effect Antique Hand Painted Frame Vintage. 6x4 Inches. Condition is New. Dispatched with Royal Mail 2nd Class. This listing is for 6x4 size frame brand new I hand paint these frames myself to give an antique vintage looking finish. Can make varying sizes please ask for more details. 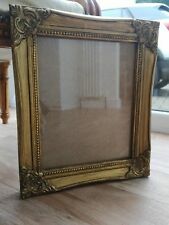 Gold Gilt Effect Antique Hand Painted Frame Vintage A4 Size. Condition is New. 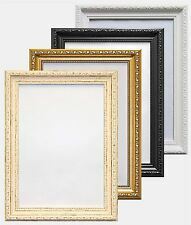 Dispatched with Royal Mail 2nd Class Hand painted and wax finished gold gilt effect ornate looking frames. I make these and can do various sizes so please ask if you require different. This listing is for X2 A4 frames. 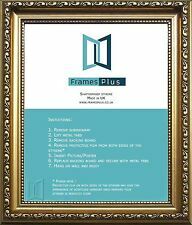 It can be used as a photo frame or as a table card frame as shown in the photo. It would also make a thoughtful gift for any occasion! Gold Frames X 2. Condition is Used. Collection in person only. A 1940s gorgeous picture of Norwich Cathedral in a gold frame by the artist F Rouson. This is a lovely old print and frame. Any questions please ask. Both designs feature modern styling and a no-doubt-about-it way to say “I Love You”. The “I Love You” design features a handwriting-like font and a blinged-out heart symbolizing the LOVE - enhanced with a unique sparkle effect. 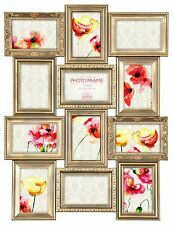 Imperial Frames Picture Photo Gold Molding Frame Floral Design 16" x 20"
Moulding size: 1.125 x 0.875in (2.86cm x 2.22cm). Solid wood 1.125" wide and 0.875" thick molding with a 0.25" deep rabbet is covered with a thin layer of gesso and painted antique-gold. Size of the print: 16" x 20" (40.64cm x 50.8cm). Colour: Gold. Antique style. Height: 27cm. Width: 20cm.